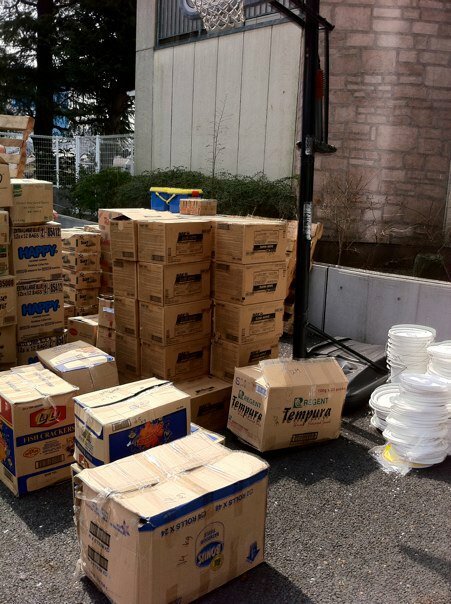 On Monday Central Bible School President Koichi Kitano and a van load of Bible school students went up to the Sendai area to help with relief efforts. They are staying at a former U.S. A/G missionary family's cabin at Takayama, a missionary camp. 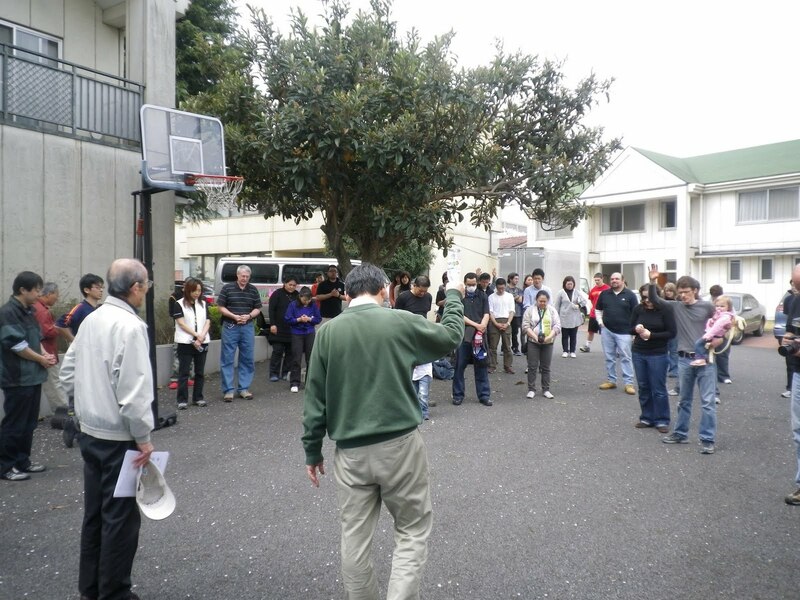 On Tuesday a Japan Assemblies of God team led by Pastor Wada left early to go to the same general area to also help with relief efforts. I, Susan Ricketts, AGWM missionary, joined the JAG team as the only woman among 8 men. 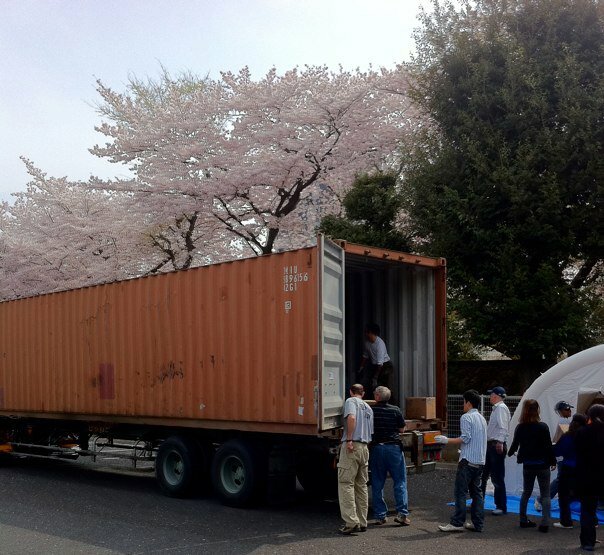 Upon arriving in Higashi Matsushima, the team shoveled thick mud from the front area of houses. Although residents have been allowed to return to their homes from the evacuation centers, only 20-30% of them have actually returned in that particular neighborhood. The tsunami flooded the first floors of their homes and destroyed or swept away the furniture and belongings. Those who have returned are living in the second floors of their homes. 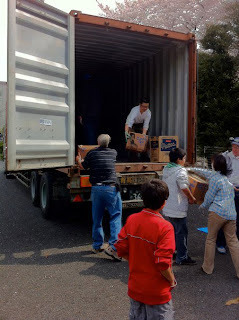 Afterward working there, we then traveled around the area as Pastor Wada pointed out places that needed help. At one point we went to Camp Moringo where Crash Japan has set up a distribution center. 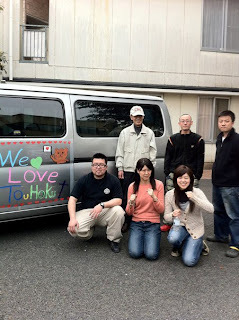 We met several missionaries there while Pastor Wada met with some pastor friends about relief efforts. Originally I was supposed to stay with the female Bible school students at the cabin. However, there was not enough room so we all went to Izumi Fukuin Christ Church, one of the JAG churches that has become a distribution center, to spend the night. At the last minute, a church family invited me to come spend the night in their home, only a 2 minute walk away. I met the Konebuta family, talked a while before praying together before going to sleep. Once I laid down on the warm futon, I prayed that we would all experience a night free of aftershocks. God heard my prayer, because we all slept soundly. I got up and walked back to the church for early morning prayer. It was amazingly passionate, loud prayer going up from our team, the Teen Challenge team, and the church members. We all prayed out loud in preparation for the new day.At one point, I heard the guy next to me pray, "God, protect us from the radiation" in English. Later, I met the man next to me, Japan Teen Challenge's first graduate staff member who is leading a relief team made up of young men newly set free from alcohol and gambling addictions. I returned to the family's home for a quick breakfast, packed my bag, said goodbye, and left for the day. As we were working, a video crew came to record what we were doing and to interview people who came to search among the recovered items. Some people found photos that they thought were lost forever. It was amazing to watch their faces light up as they discovered lost memories of loved ones. This morning the news clip appeared on TV. Sou Yamamoto, who was a member of our JAG team, was interviewed along with Kitano Sensei, as they sat cleaning photo albums with great care. We finished up at around 4 PM and waited for our rides to show up. (A few team members of both groups had gone to another area to help with efforts there.) 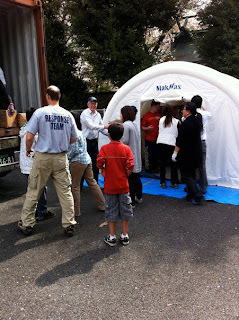 As we headed out, we continued to note the areas greatly damaged by the tsunami. Every bump in the road reminded us of the damage caused by the earthquake and its many aftershocks. As for fuel, we stopped once on Tuesday to fill up with diesel and then once on our way back to Tokyo. I asked our driver how much it cost to fill up the 10-passenger van fuel tank. 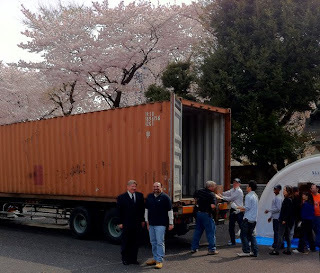 A full tank cost about 5,000 yen (~$60.00). So roughly, the 5-hour trip cost about $120.00 for fuel. Since we had an emergency sign for our vehicle, we did not have to pay tolls which would have cost more than the fuel itself. I had expected difficult conditions because of the aftershocks affecting water utilities and electricity. I expected to see overwhelming devastation. In spite of much clean up that has already taken place, I still saw unbelievable destruction in places like Ishinomaki, Shichigahama, and Higashi Matsushima. (Those places still do not have working traffic signals so the police directs the traffic.) Those places were struck hard by the brute force of the monster tsunami. On the other hand, I did not expect to have a hot shower that I had at the church Tuesday night. I did not expect to sleep in a warm futon as I was supposed to sleep in a sleeping bag at the cabin. I did not expect to meet so many new friends with whom I was able to talk freely and easily in Japanese. I did not expect to see convenience stores open in so many places with electricity, running water, and working toilets.